Canary Island Pyramids but did the Guanches build them? Mysterious pyramids in Tenerife and La Palma in the Canary Islands have been the subject of heated debate. Are they piles of stones or were they made by the Guanches? In Tenerife and in La Palma in the Canary Islands there are pyramid-like constructions that are a mystery. No one has proved satisfactorily when they were built or who by. An ongoing debate has been going on for many years with several theories put forward. Most academics have favoured the idea that the pyramids are actually what remains of agricultural terracing or are merely piles of stones that farmers were clearing from their land, other people have suggested that the constructions were made by the Guanches who were the original islanders who were conquered by the Spanish, and a third idea is that Freemasons constructed the monuments. It has even been claimed that one complex of pyramids in Güímar, which are the most well known of all, were made in fairly recent times so that money could be made from charging tourists to see them. However, a book entitled Los Guanches by Spanish author Domingo Lima Dominguez and published in 1985, clearly states that the Guanches in La Palma made pyramids. The question that springs to mind is if they could do this there, then why not in Tenerife too? Los Guanches was published by Centro de Cultura Popular Canaria, a very respectable publisher so it seems strange that the author’s words have been seemingly ignored and are not quoted elsewhere. There is no mention of the pyramids in most other books published on Tenerife that deal with the subject of the Guanches, and yet Dominguez was born on the island in 1942 in the town of La Orotava. On page 44 of his book, the author wrote: “Los palmeros adoraban a Abora, en cuyo honor se erigia una pirámide pétrea en cada uno de los doce reinos en que estaba dividia esta isla.” Translated this means: The Palmeros (La Palma Guanches) worshipped Abora, and in his honour they erected a pyramid of stone in each of the 12 kingdoms that were divisions of this island. The story goes that world-famous explorer and adventurer the late Thor Heyerdahl first heard about the Güímar pyramids in 1990 when he read about them in an article by Francisco Padrón in the Diario de Avisos Tenerife newspaper. At that time they were on neglected land that was probably going to be scheduled for development. Heyerdahl had come to the world’s attention when in 1947 he successfully sailed his raft the Kon-Tiki across the Pacific Ocean from South America to the Tuamotu Islands. He believed that ancient people were crossing the world’s oceans long before Columbus, and with his voyage he proved this was possible. He came to Tenerife to investigate the pyramids for himself and in 1991 declared that they were authentic stepped pyramids like those he had seen elsewhere on his world travels. He befriended shipping magnate Fred Olsen who bought the land on which the constructions were situated and the two men set about building what is now known as the Ethnographic Park. Heyerdahl was so impressed with the pyramids and the island that he decided to settle in Güímar, and in subsequent years he claimed to have discovered astronomical orientation for the pyramids, and suggested that the ancient people who built them were most probably sun-worshipers due to the alignment of the constructions. There are those who say the pyramids were built as a modern money-making venture which Heyerdahl and Olsen got together on and that there were no pyramids before the explorer got involved. Proof has been found that shows that this is not the case because a photo of Andrew Baillon was taken standing on top of one of what were to become known as the Pyramids of Güímar before Heyerdahl was on the island. The photo was supplied by American author Gordon Kennedy who has spent many years researching the Guanches and is the author of The White Indians of Nivaria. Now even if it was true that the Güímar ones had been built to be part of a modern theme park, or that they were just “piles of stones” left there by farmers before Heyerdahl’s involvement, there are other equally impressive looking pyramids on the other side of Tenerife that have been very conveniently ignored. The question needs to be asked: who built them and when and why? Was it the Guanches? In the village of Santa Bárbara just outside Icod de los Vinos, which had been a Guanche stronghold, there is a large five-sided stepped pyramid surrounded by farmland, as well as some others in very poor state of repair. One of these constructions is right by a house but has lots of its stonework fallen away. The local cake-shop on the road through Santa Bárbara is called the Pasteleria la Pirámide. On a road known as the Camino de la Suerte, which is again just outside Icod and near to the village of San Marcos but going to El Guincho, there are two more pyramids and one of these is very large and imposing and stands in a banana plantation. If the Palmero Guanches did indeed build 12 pyramids of stone on La Palma it seems likely that most have been demolished just like this has happened on Tenerife, where if the same system had been used there would have been pyramids built in each of the nine kingdoms there. However, there is a pyramid located above Cancajos near the capital of Santa Cruz that still stands today. It is in the Aridane valley and known as the El Paso Pyramid. 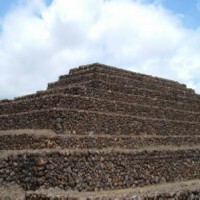 Although it is a relatively small construction it appears to be a stepped pyramid like those in Tenerife. The pyramids on both islands are not recognised as historical monuments and so are not protected by law. Only the ones in Güímar are safe because they are on the land that Olsen bought and which now forms the Ethnographic Park. It seems evident that what is really needed is a properly funded investigation into these pyramids by a non-biased team of archaeologists. Those in Tenerife have already decided the constructions are just heaps of rocks so they are not interested, and yet the majority of people who view these pyramids think they are a lot more than what the academics say. Copyright © 2012 Steve Andrews. All Rights Reserved. Certainly the Guanches used the spiral as a symbol. It was incorporated into a pintadera (ceramic seal). I am actually wearing this design in a small silver pendant. Thank you for commenting! Try to copy the petroglyphs. This way you will save them, even if the pyramids are destroyed. I do not think that the pyramids were signs of good agricultural land, as the people would have known such land anyway. I think that they ritualized or gave sacred significance to this kind of land and water. They turned a physical landscape into a ritual one. Spirals! They have long been associated with the Great Goddess, the being worshipped by the first humans. Goddess spirals are well known in Britain and Ireland, and are found in megalithic tombs like Newgrange, Ireland's pyramid made of earth. Earth has always been sacred to the goddess. I said earlier that the Guanches might have worshipped the sun, which is male according to depth psychology. This sun worship allies with worship of a feminine earth deity, represented by spirals. God and goddess, earth and sun, worshipped together, this seems very appropriate. Pagans always worshipped paired gods and goddesses, male and female apsects of divinity. Spirals represent the great mother. Thanks for your great feedback! Yes, sadly only the Guimar ones have any sort of protection here because Olsen bought the land. Very interesting article. Thank you. Since visiting the Spiral Petroglyphs at Zarza in La Palma two years ago I have become absolutely fascinated by everything associated with them. I asked the girl in the office at the entrance what she thought they were and who made them. She explained that they thought they were signs to indicate good grazing and agriculture land, and also that there maybe water nearby. I must admit to being rather sceptical of this explanation. So upon my return to Tenerife (where I live) I visited the Museum of Mankind in Santa Cruz and discovered that similar spirals have been found in the Peninsular, Northern France, Ireland, England, Scandinavia, and the rest of the world. . I am returning to La Palma this month to seek out the other Petroglyphs on the island and also the pyramids. I have therefore spent the last week researching the internet for more information. I must admit to being mortified to discover that similar pyramids have already been destroyed in the Orotava valley in Tenerife by developers! How long will it be before the pyramids in the Icod area are destroyed if they are not protected? Some of the petroglyphs at Zarza have already been destroyed by vandals and are now fenced off from the road to try and protect them! There is no doubt the pyramids on La Palma and Tenerife are not as aesthetically beautiful as similar structures in the Americas and Egypt, but they are still very similar! I understand that Graham Hancock and Robert Bauval attended the summer solstice celebrations at the pyramids in Guimar in 2000. I wonder they were made aware of the other pyramids on Tenerife and La Palma, not to mention the Petroglyphs! I agree with you so thanks for your comments! Great article on an original subject. Thor Heyerdahl is something of a hero of mine, so it was great to find out something more about him. The pyramid is the simplest large structure to erect, so it is likely that many ancient peoples erected them, and this includes Guanches. So there is no problem in thinking that Guanches constructed them. Furthermore, there is a strong link between pyramids and solar worship, so this fits in with the stories that the Guanches worshipped the sun from the pyramids. Why should we think that megalithic cultures could not erect large structures. We have Stonehenge, so why not Guanche pyramids? There is a deep prejudice against accepting that conquered peoples were ever competent, as to think them so undermines the excuse for conquest, that the people needed their conquerors to civilise them. I think that this operates in the case of the Guanches. One way to ascertain the date of origin would be to access the land surface below the pyramid through excavation and do some radio-carbon dating on the the soil surface. Thank you for reading my article and finding it of interest! I wasn't aware of the Guanches history and culture. Your articles manage to offer a broad perspective on a subject that it seems that require more attention. Thanks again for your feedback. I have seen examples of the sort of problems here which you describe with people who deny that the Guanches had boats, built pyramids etc, and many know very little about them anyway! I assume that the destruction of an important discovery was the petroglyphs that were vandalised in a single night. That story went out in the media here a couple of years back and the blame was put on developers that wanted the land. Great stuff mate really. These kind of articles are the only way we can help to properly identify and preserve Canarian / Pre-Colombian history and prevent it from being completely destroyed by the hands of corrupt politicians, developers, deeply rooted colonial fascists and also, unfortunately, from the hands of some of the ignorant Canarians that have been subject to a corrupt 'Madrid style' education that hasn't included aboriginal Canarian history until late. This has resulted in generations of disinterest and disregard for preserving Guanche history and has stopped many Canarians from pursuing careers related to accurately defining Guanche history such as archaeology ect. More recently I was saddened to hear that a significant archaeological find was discovered in Santa Cruz city (Tenerife) which was then completely vandalised and destroyed by criminals in the night.... Well it just so happens that this significant find also sits on land that developers are planning to build multi million pound apartments overlooking the city and port. The Guanches lived on the Canary Islands before the Spanish Conquest. They had white skins and blonde hair. Hummadruz is a word made up of "Hum" and "Drone" and "Buzz". It describes a strange humming sound. It is a mystery.